Fund-raising Hypnotist Event Fundraising information package enables any group, team or club meet their financial fund raising goals with Bruce James's hilarious comedy hypnosis show. While demonstrating the power of the mind he provides excellent comedy entertainment for fund raising while being a great fund raising idea for your next fund raising event! Whether your fund raising needs are for a non profit fund raiser, school fund raiser, high school fund raiser, church fund raiser, cheer leader fund raiser, the hypnosis show is a great entertainment idea and an easy fund raiser to sell tickets and organize. Contact us and begin get your promotional package today! 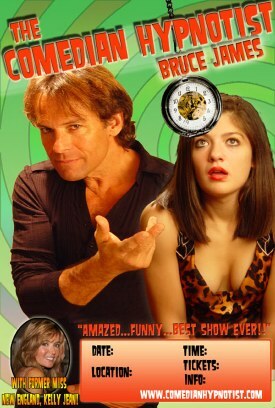 Bruce James comedy hypnotist will leave a powerful impact with students. This clean comedy high school stage hypnotist can be a perfect solution for safe grad party entertainment or post prom entertainment. The Bruce James Comedy Hypnosis Show is a wonderful solution if you're looking for ideas to raising money to offset a budget cutback that is fun, east to succeed, fast-pace and contemporary. Get dazzled, amazed and experience one of the funniest best stage hypnosis shows ever! Don't miss this energetic mix of comedy, hypnosis, and non-stop laughter from start to finish during this hysterical Las Vegas Show style hypnotic performance. 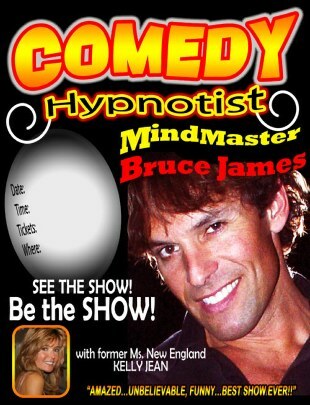 Bruce James Comedy Hypnosis, with is available for comedy clubs and corporate entertainment and fundraising events. Bruce James has performed coast to coast in over 35 states for several hundred schools and clubs seeking to raise money for various causes. He and his assistant, Kelly Jean (former Miss New England), provide a quality adult comedy hypnosis show that is classy and entertaining. Bruce takes volunteers from the audience and makes them surrender to the sound of his voice; to become the stars of the show, and the results are hilarious. You will laugh and applaud for your friends and family on stage, as you have never seen them before. Often the most quiet introvert becomes the brightest entertainer. 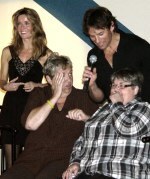 ability to transform your friends as you experience first hand, the amazing power of hypnosis! How Does the Fundraising Program work? Imagine holding a fundraiser that was easy, fun and profitable. Would you be surprised if I told you that YES . . . it is possible. it is to raise the much needed cash for your group. We will arrange a date and time for your show. An intial fundraising information package to present to your group of planners. posters, ticket templates, press releases, and a contract agreement. we provide the show, music, props . family member do some really amazing things. receives the money for the first 50 tickets. After the first 50 tickets we split 50/50. We can negotiate, but this is often the way it works. Great money, great show! With no risk on your part. you'll see how easy it is to sell tickets. the door and they can get the bar. Are tickets hard to sell? at campuses and fraternal clubs. People have a chance to become the stars of the show. It is the ultimate in audience participation, a “REAL” reality show. Your event will be talked about and remembered for a long time. Often we have limited dates available! The sooner you set a date the better. that will not conflict with other local activities. but weekday shows still draw large happy crowds. What are the Risks involved? Virtually None! Due to numerous requests we have formulated a special fund raising program. you or your organization even one dollar to get started! The show is "NO RISK" to you! you need at no cost to you guaranteed. Your community will be excited to attend this terrific program. This show is great entertainment! It's unique and fun. Hypnosis is a natural state of mind and is extremely safe. What is the overhead for the show? Why do you do fundraising shows? bake sales, candy sales and flee markets. enormous amount of time and money. which makes tickets very easy to sell. your group enjoyed the show. Our show structure . . . includes . . .
- We will customize the show to meet your organizational needs. - If your interested is in fund raising you name your cause, and we'll help you make money!! We have a fundraising guidebook to help you succeed. The Show. What can you expect? The audience is typically filled with anticipation with various questions, i.e. Who's going to volunteer? Will I be forced to volunteer? Can I be hypnotized? Is Hypnosis real? When the show starts, I state to the audience what's going to happen and make them at ease. I tell them what they can expect and let them know I'm not going to make them cluck like a chicken... I will have fun with them... but always have the intent to inspire my volunteers. Then we get the audiences attention with some suggestibility tests while they are seated in the audience. We then ask for volunteers. By now, the audience has gained trust and typically we always fill up 12 to 15 straight back chairs. The induction last approx 5 to 6 minutes. This is when the fun begins. The volunteers are transformed into dancers, musicians, regressed to 6 years old, speak fluent foreign languages and much much more. The content and presentation is always done tastefully and with respect and is designed to unite your group with an experience they will never forget. Mostly, those that had disbelief, become believers as they see their friends and acquaintances on stage like they have never seen them before. We often end the show with post hypnotic suggestions that bring the volunteers to life again doing celebrity performances i.e. Brittany Spears, Elvis or ever Richard Simmons! In addition, each volunteer will receive powerful suggestions for self confidence, greater control of their thoughts and the focus and tools to make significant permanent changes in their lives. At the end of the show, you may use the sound equipment to make any announcements or further communication to your group. If needed, we can provide a DJ that can play music before or after our show to warm up the party or keep the party and dancing going. Call us if you have any questions or wish to check our availability. What type of fundraising hypnosis event are you seeking?